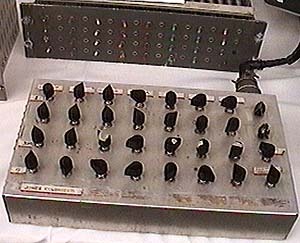 The Jones Colorizer was designed and built by David Jones for the Residency Program at the Experimental Television Center. A colorizer takes as its input a black and white video signal, then adds color in a fashion according to the type of colorizer. Usually a colorizer unit contains other video processing as well, such as negative video, keying, mixing. The two colorizer systems at the Center, The Paik/Abe Colorizer and the Dave Jones Colorizer. The Jones Colorizer is a multi-functional image processing device which can accept up to six video signals, add a color of separate hue and intensity to each signal and combine them at a single output by a variety of techniques including cross-fading, multi-level keying and two types of mixing. Each of the six channels can control gain and pedestal levels of the incoming signal, choose a hue from a three color system to mix it with and key the colorized image using either the original input signal or an input from any of the other five channels as the clip source. Additional controls include the polarity of the signal, saturation of color, the clip level and the softness of the key edge. All of the parameters, except image polarity and clip input select, are voltage controllable and can accept very high frequency control voltages. The video colorizer was designed by Dave Jones at the Experimental Television Center in 1974 and 1975, and funded by a grant from the New York State Council on the Arts. Each of the channels functions in the same way, as shown in Figure 1. A video signal selected at the matrix goes into a voltage control amplifier or VCA (Figure 1, I) where the polarity can be changed by a switch on the back panel marked "normal" and "negative". The negative position reverses the gray level values of the image. The gain and pedestal of the image are also controlled here by two knobs, located in the upper left hand side of each channel. Color is derived from the subcarrier informationsupplied by the sync generator in the Image Processing system. The 3.58 MHz signal goes into an RGB encoder (Figure 1, II) which splits the signal into three separate hues: red, green and blue, the primary colors of video. The accuracy of these hues at the output is relative to the adjustment of the phase control on the main output amplifier in the Image Processing system. The three color controls will always represent hues 120 degrees apart on a color wheel. The phase control on the output amplifier rotates all of the hues of this color wheel at once. At the proper setting the outputs of the encoder will be red, green and blue, which are mixed in various proportions through a color mixer (Figure 1, III) by the three color gain pots. The combination of any two of these signals will yield secondary colors. For example, red plus green equals yellow, blue plus red equals magenta and so on. The combination of all three hues is white. Therefore, all three pots turned up will cancel each other out. The output of the VCA and the color mixer are combined through another mixer (Figure 1, IV) where the intensity or saturation of the color is determined by the chroma knob. Finally, this colorized signal goes into one channel of a keyer (Figure 1, V) with black going into the other channel and a clip source that makes either a soft or hard edged transition between them. This clip source can be derived from either the original signal or from any of the other five inputs. Figure 2 shows how the clip select system works. Each input to the colorizer is split seven ways. The first goes into the designated channel to be colorized. The other six go into the individual clip select busses for each channel. Therefore, each channel has the same number of options for a clip source selected by a six-position rotary switch for that channel. If the same signal is chosen for the clip input as for the main channel input then the keyer will mask out the whitest areas of the image, passing only those portions of the colorized image which fall below a certain gray level. This gray level is adjusted by the clip level control. If one of the other five input signals is chosen as a clip input, that signal will determine the cut-out shape between the colorized image and black. Even though the maximum number of signals combined at the output is still six, the possibilities of combinations within a channel and between two channels is greatly expanded. Keyers on channels 1,3 and 5 are pre-set to key out the whitest areas of the clip signal first. That is, when adjusting the clip level control on these channels for a specific gray level, black will be inserted on the screen anywhere whiter than that gray level. The colorized signal will remain anywhere blacker than that level. Channels 2,4 and 6 are pre-set to key out the blackest areas of the clip signal first. The clip input is still determined by the clip select bus for each channel. Changing the polarity of the VCA input will not affect the key orientation. The "hard/soft" knob controls the amount of discreteness in the border between black and the colorized signal. The counterclockwise position allows a fully dissolved or continuous transition. The output of each channel goes into a main mixer which uses one of two methods for combining the signals. An additive mixer is the type most widely used in Special Effects Generators. In this case the gray levels of each of the incoming signals is averaged out for each point in the frame. Diode mixing is a more selective process where only the brighter areas of each channel pass through. A two position switch on the top panel makes the selection between these two forms of mixing. The final stage of the colorizer is an output amplifier where the master gain and pedestal can be controlled. 1. Set the clip select switches of each channel to the corresponding input of that channel. Set Channel 1 clip select to "Ch 1", Channel 2 to "Ch 2" and so forth. 3. Turn the "hard/soft" knobs of each channel to the clockwise position. Set the chroma switch to the back for diode mixing. 4. Turn all of the other pots on each channel to the counterclockwise position. 5. Set the master pedestal control to center position and the master gain control to the center position. 6. Select the input for Channel 1 at the matrix, look at the signal directly through the output amplifier first before going into the colorizer to see that the gain and pedestal are within the proper range. 7. Look at the output of the colorizer and adjust the gain and pedestal controls of Channel 1. With Channel 1 gain set in the center, the range of the pedestal is from 12 to 4 o'clock or about 120 degrees. Any setting above or below this will not show anything at the output of this channel. Select the pedestal level, checking the waveform and video monitors. 8. Turn the chroma control to approximately the center position. 9. Turn the red gain knob clockwise. 10. Adjust the master phase on the output amplifier until the hue is red. Look at the vectorscope to see if the signal is in the range of the "R" hatchmark. 11. Turn down the red control knob and turn up the green and blue control knobs separately to insure that the phase is adjusted correctly for the primary hues. 13. Turn up the clip level control slowly to the desired level. Turn the soft/hard control knob counter-clockwise to the desired level. At this point, turning the pedestal knob clockwise slightly will compensate for the darkening of the colors after the clip level was adjusted. Select the input for channel 2 and repeat steps 7-8 and 12-13. Do not readjust the master phase on the output amplifier. It is advisable to slowly try all of the variations in combining Channels 1 and 2 before adding more inputs to the system. Switch between positive and negative inputs for each channel. Set Channel One's clip select switch to "Ch 2" and then Channel Two's clip select switch to "Ch 1"
Try slowly-varying control voltages applied to the above parameters. For example, use the same oscillator and patch the positive sine out into the VC gain input of Channel 1 and the negative sine out into the VC input of Channel 2 with both clip levels set to the far left. This will result in a cross-fade between the two images. Try the same thing into the VC clip level inputs of Channels 1 and 2, the hard/soft inputs and various combinations of RGB inputs. For clip, gain and pedestal controls, patch the VC input into an attenuator first because none of the inputs has built-in attenuators. For RGB modulation, patch the negative output of an oscillator into one of the R,G,or B gain inputs and the positive output of the same oscillator into a second one of the R, G or B inputs. The control voltages can be unattenuated. The colorizer can be used to mix different inputs or to assign different colors to different gray level areas of a single input. This technique is called quantizing. It is done by selecting the same signal for several channel inputs. Using an image with a wide range of gray levels, the clip levels of each channel must be adjusted so as to not cancel one another out when selecting gray level areas to be colorized. Even more complex graphic combinations can be accomplished by applying control signals above 60 Hz to the CV inputs of the clip level and pedestal. The colorizer is designed to take control voltages with frequencies that are several multiples of horizontal sync. The VCAs of each channel will pass color. Changing the polarity of the signal will give complementary colors which can further be colorized. It is best not to have a color signal going into the clip inputs. If you want to use the same signal as the clip input, put the color signal directly into the desired channel. At the matrix, route the same signal into the color kill and then into a separate channel of the colorizer. Use this color kill output as the clip input for your channels. Set the chroma switch to the front. Turn the pedestals on all channels clockwise, even if you are only using the outputs of one or two channels. If you don't, nothing will be presented to the output.